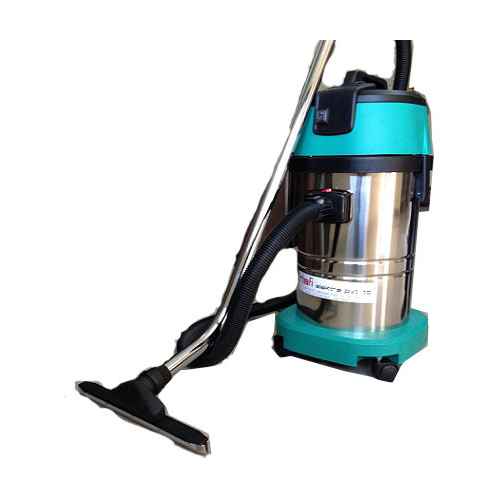 We are offering Wet and Dry Vacuum Cleaner to our clients. The wet & dry vacklin series are industrial Vacuum cleaners for medium and large areas. The vacklin series was designed according to up-to-the-minute perspectives and viewpoints of cleaning technology and offers a great many possibilities of application. The vacklin series are equipped with special tools for specific cleaning jobs. Whatever you require to pick up, we have the accessories to help you to get it done. It makes no difference if it has to swallow wet or dry, coarse or fine dirt, gloss splinters, stones, metal chips, the dust-the small vacuum cleaner with its enormous performance vacuums just everything, doing a powerful and clean job. This is because the dust is collected directly in the metallic container and not the bag, hence preventing frequent filter clogging. The vacklin series are not only perfect in its performance but also offers the advantages of easy manoeuvrability. Equipped with a heavy duty all welded tubular chassis of unequaled strength and suitable for movement over any sort of surface, inside or out. A squeeze tool that can be installed easily guarantees high volume floor nozzle for cleaning a wide swath in just one pass. It has a specifically designed tank which can be tipped back for easy emptying. The vacklin series can be used for garages, car washing, schools, departmental stores, workshops, carpets cleaning, suction of sea/rainwater from buildings, yards, water tank cleaning, etc. These specifications have been appreciated by industrialists, farmers, heating engineers, chimney sweepers and the like for many years. Established in the year 1988, at Pune (Maharashtra, India), we, Hafi Elektra Pvt. Ltd., are one of the renowned manufacturers, exporters, and traders of a qualitative range of industrial Vacuum cleaner, Dust extractors etc. Our exclusive product range includes Floor Cleaners, Oil Recycling Units, Dust Extractors, Heavy Duty Floor Scrubbers, Flux Recovery Units, Mist Extractors and others. Being a quality conscious company, our products are designed with high accuracy in order to meet the international quality norms. Apart from this, our offered range is fabricated in a well-armed production unit by making use of superior quality factor inputs and modern technology. Owing to their features like sturdy construction, superb performance, low power consumption, consistent functioning, corrosion resistance and longer service life, these are always in high demand by our clients across the country.